Native New Mexican, and Thoreau resident, Arthur Anthony "Tony" Otero was born in 1967 in Rehoboth. He grew up on a small ranch in Thoreau, New Mexico where his interest in art came about when he was around 5 years old., or as he puts it, "since (he) could hold a pencil." He graduated from Thoreau High School and moved on to Phoenix, AZ where he worked as a Utility Engineer. In 1989, Tony moved back to Thoreau and began consulting for companies involved in Native American Art. It was then that he decided to persue his own artisitic abilities and became "Tony The Dollmaker" in 1993. 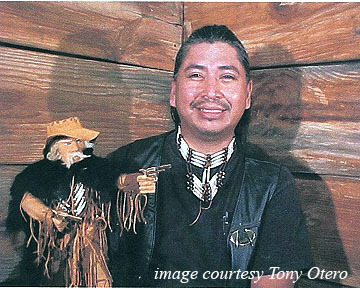 In 1994, inspired by the joy his work brought to people, he started making dolls, specializing in Kachina-type dolls. The first doll he created was a bow hunter by the name of "Shadow Warrior" which was representative of a Dog Soldier of the Cheyenne tribe. Tony then created "The Mountain Man" as a close friend to the Shadow Warrior to teach him about the ways of another world. "The Mountain Man" represents the spirit of the pioneers who integrated with the Native Americans and their culture. Tony first carves his dolls out of wood, then makes all of the clothes and artifacts from leather, wood and steel. Tony's dolls have won both first and second place awards at the Utah and New Mexico State Fairs.